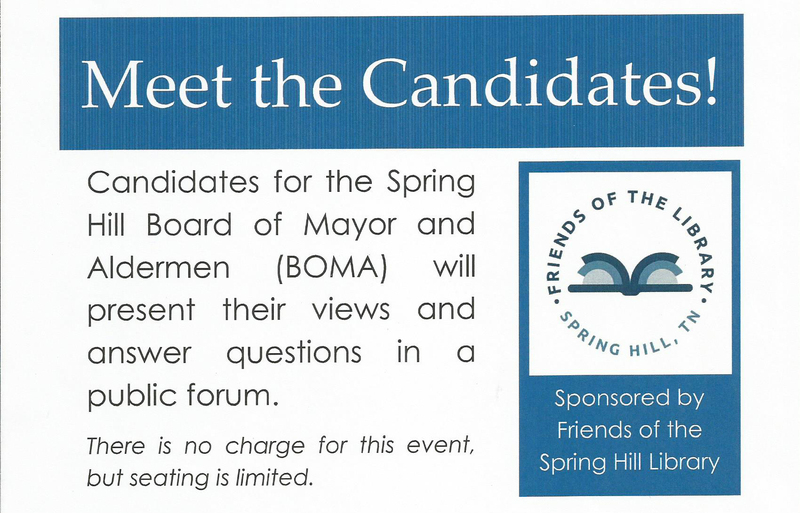 The Friends of the Spring Hill Public Library will host a Candidates Forum on Tuesday, March 14, 2017 as a public service to the citizens of Spring Hill. All candidates who qualified to run for seats on the Spring Hill Board of Mayor and Aldermen have been invited to participate. The Candidates Forum will be held from 5:15 to 7 p.m. in the multi-purpose room of the Spring Hill Public Library, 144 Kedron Parkway. The event is free and open to the public. Candidates will be provided an opportunity to introduce themselves to the electorate and to speak briefly about their respective visions for the City, with a focus on important issues facing Spring Hill. A “question and answer” period, moderated by a member of the Friends of the Spring Hill Public Library, will follow at the conclusion of the candidates’ remarks. Seating at the Candidates Forum is limited due to physical space and is on a first-come, first-served basis. For more information, contact the library at 931-486-2932.